Bobkat, Other Shape Guitar from Airline. 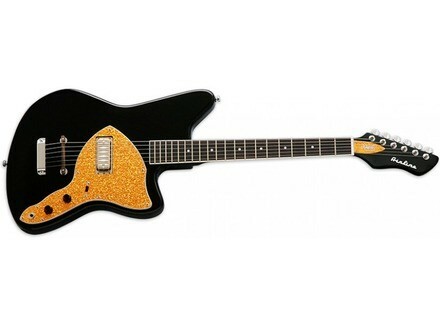 Eastwood Guitars brings the Airline Bobkat back to life. The Airline Bobkat is a 25 1/2” scale solid basswood guitar with a bolt-on bound maple neck, rosewood fingerboard, dot markers and a 1 5/8” width at the nut. This retro-style guitar has a 60’s vibe with a fixed adjustable wooden bridge, and it features the Airline Single-Coil Vintage Argyle Pickup with a solo/rhythm switch and a volume and tone control. Eastwood has also added an adjustable truss rod. The Airline Bobkat comes in a bright candy apple red and features a raised white Airline logo on the matching red headstock. Announced street price of under $400 US. The Airline Bobkat model is available now at Airline Dealers. Visit www.eastwoodguitars.com for more details. TC-Helicon Updates for VoiceLive Play TC-Helicon releases "More Play-Direct Effects Control & Preset Mega-Pack", a free firmware update for VoiceLive Play and VoiceLive Play GTX. Effectrode Blackbird Pedal The SR-71 ‘Blackbird’ is a two channel tube preamp in a pedal with two truely independent channels. Win a Lâg Tramontane T400DCE Lâg Guitars is once again giving musicians in the US a chance to win a Lâg Tramontane T400DCE, this time autographed by Gus G.